Turn your bathroom into your personal spa. The pressure to slay every day can be a strenuous task, leaving us feeling tired and overwhelmed at the end of each day. It’s understandable that all you want to do is relax as soon as you get home. Creating a relaxing atmosphere will help lower your anxiety, making you feel better. Switch off the lights and use a lamp or a set of candles instead. Low lighting tells your mind and body that it's time to unwind, and it lets you rest your tired, bleary eyes. Play some soothing music, too. Smooth jazzy tunes, calming, lyrics-free music, or nature sounds are great for promoting relaxation in your private space. Finally, unplug from electronics—nothing kills peace better than a buzzing cell phone or an email alert. As soon as you get out of the shower, pat yourself dry, then apply a nourishing oil all over your body. Most body oils contain an aromatic blend of essential oils that help dispel stress and anxiety; they also soften your skin and give it an instant glow. Scents are known for boosting tranquility, evoking positive emotions, and relieving stress. Essential oils, diffusers, and scented candles are the easiest ways to infuse soothing aromas to a room and set the mood. Consider scents like lavender, jasmine, or vanilla for an instant calming effect. Before you introduce scents into your personal space, make sure to first clear out bad odors and toxins from the air. 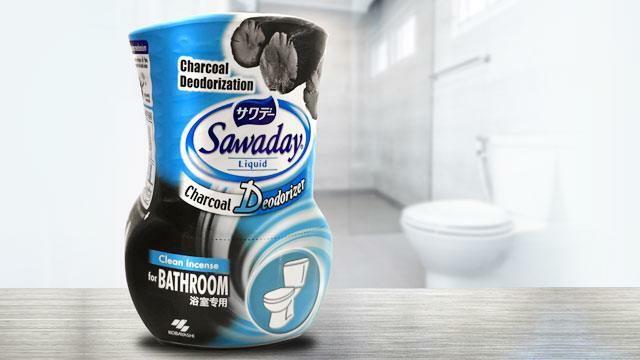 Consider decking out your bathroom with Sawaday Charcoal Deodorizer, a liquid air purifier with an activated charcoal filter that effectively absorbs foul-smelling odors. Made for the bathroom, this purifier even comes with clean incense to keep your space deodorized for up to two months. Sawaday Charcoal Deodorizer is available in Mercury Drugstore, Robinsons, SM, Shopwise, and all leading supermarkets nationwide for P145. For more information, follow Sawaday on Facebook. This article was created by Summit Storylabs in partnership with Sawaday.